Frame Size (H x L): Approx. 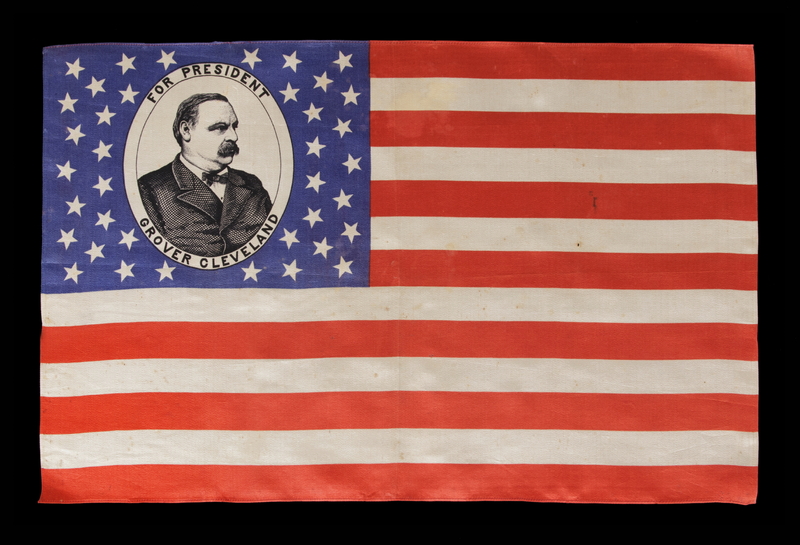 27.75" x 36.25"
Flag Size (H x L): 15.75" x 24.25"
Printed on silk, this American national parade flag was made for the 1884 presidential campaign of Grover Cleveland. 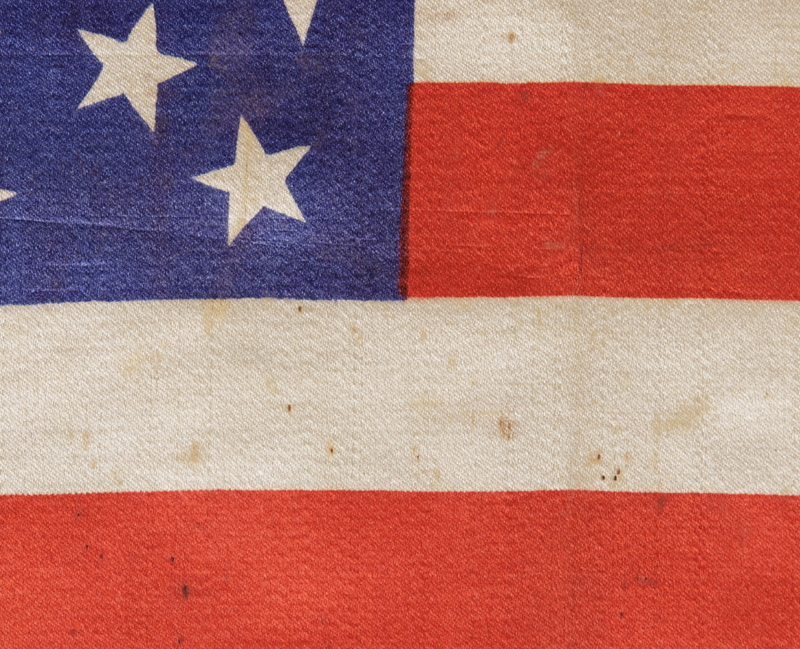 The flag’s 38 stars are clustered about an oval medallion in the center of the canton. 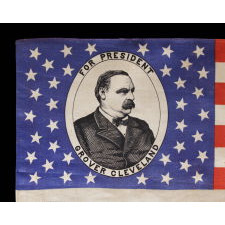 Printed in black ink, this frames a well-executed portrait of the future president, above and below which are the words “For President” and “Grover Cleveland”. Note how the stars vary greatly in their vertical alignment, which lends a nice whimsical element to an already attractive design. 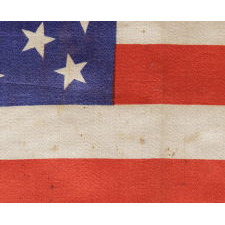 In cooperation with the image and the fine silk fabric, what results is one of the most beautiful cantons found in early American parade flags. 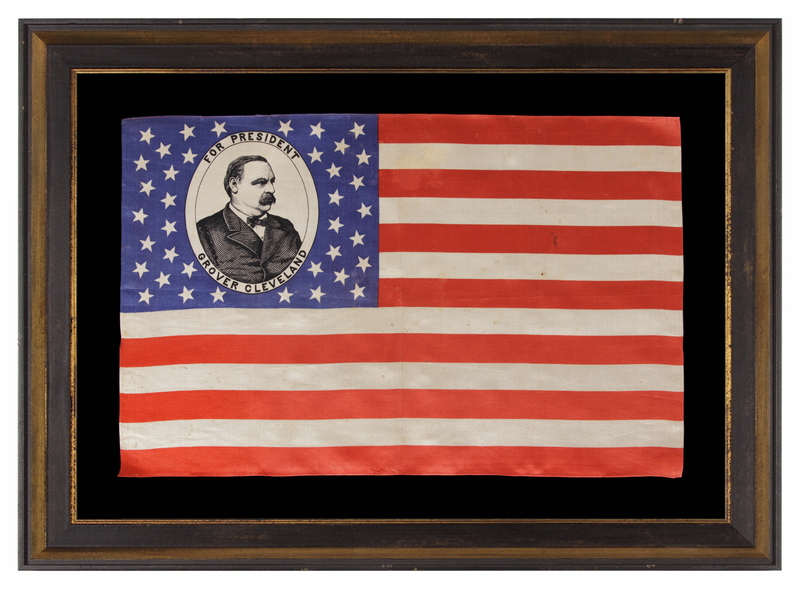 Some political campaign parade flags were produced by one flag-maker, in the same style, but for two opposing candidates. 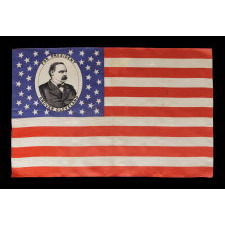 Another flag in this format was made for Cleveland’s Republican opponent, James Blaine. An example of the Blaine flag is documented in “Threads of History” (Smithsonian Press, 1978). It was donated to the Smithsonian by members of the family who owned the Cheney Silk Company in Manchester, CT, one of the nation’s largest silk manufacturers. It is therefore is safe to assume that the Cheney company made these flags, or at the very least, the silk on which they were printed. The Cleveland example is also pictured in the Smithsonian text, yet not from the Cheney accession. 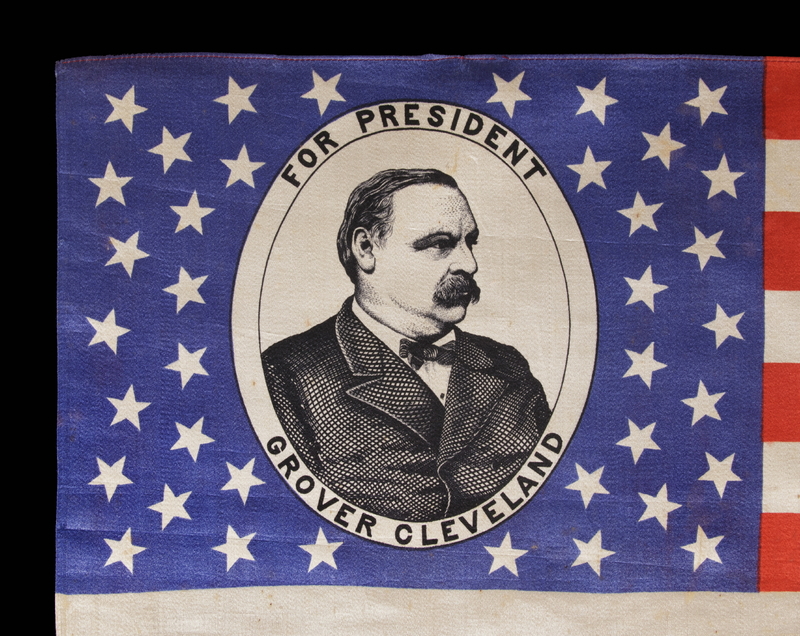 This was the first of three times that Grover Cleveland would run for president, and one of two times that he would win. He was the only man to serve two non-consecutive terms (1884-88 and 1892-96) and was the only president to get married in the Whitehouse. In 1886, at age 56, Cleveland married his 22-year old ward, the daughter of his former business partner, who subsequently bore him five children. Cleveland, a Democrat who appealed to moderate Republicans, had first served public office as a local sheriff, then as Mayor of Buffalo, and finally Governor of New York. He was an imposing, five-foot eleven, two-hundred-sixty-pound man who was thought of as a ‘regular Joe’. By contrast, Congressman-turned-Senator, James Blaine “Of the Great State of Maine” (so hailed by his supporters), was generally regarded as pompous, flamboyant, and corrupt. This was at a time where robber-baron types, like New York’s Jay Gould, were at the height of their influence and aligned with Republican politicians. The primary scandal of the 1884 election surrounded claims that Cleveland had a ten-year-old, illegitimate son. Though the truth of the matter was never fully substantiated, Cleveland, a bachelor, owned up to the allegations publicly and paid child support, even though the mother of the boy was a widow of questionable character with regards to her promiscuities. “Ma! Ma! Where’s my Pa?” was the chant of rival Republicans. Mounting: The kerchief has been hand-stitched to a background of 100% cotton twill, black in color. The cotton was washed to remove excess pigment. An acid-free agent was added to the wash to further set the pigment and the fabric was heat-treated for the same purpose. The mount was placed in a black-painted, hand-gilded and distressed Italian molding. Spacers keep the textile away from the glass, which is U.V. protective. 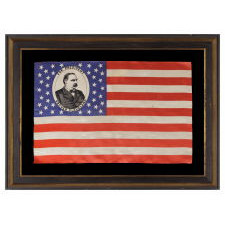 Condition: This is perhaps the very best condition that one can hope to find on an example of this particular flag. There is very minor foxing and staining, very minor bleaching in the canton, and a pinprick-sized hole in the 4th white stripe. moderate fading of the red stripes and the blue canton. There is minor water staining, particularly in the stripe field beyond the canton. There are two small splits accompanied by a nick of fabric loss in the last white stripe at the fly end. There are more minor splits elsewhere throughout. Many of my clients prefer early flags to show their age and history of use.